This is another devotional I recently wrote for the Christian association at work. 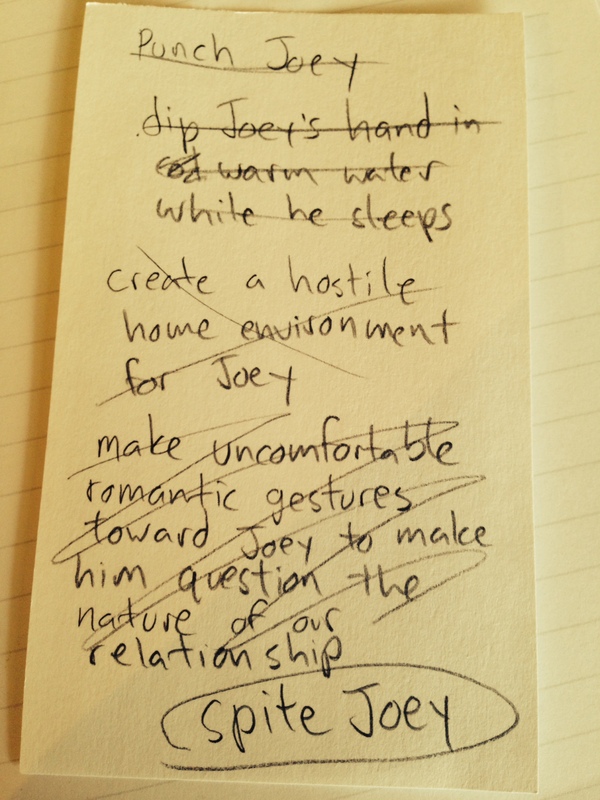 When I was a child, my younger brother Joey did something that made me very mad. I don’t remember what he did, but it made me so furious that I wanted to never stop being mad at him about it. Simply deciding not to get over it wasn’t enough, though, so I took extra measures to make sure that I wouldn’t forget to be mad at him: I taped a piece of paper to the wall by my bed, so I would see it first thing in the morning. It said: “Spite Joey”! It took some serious brainstorming to get the wording just right. Looking back at this now, of course, it seems pretty silly. But it occurred to me that, as much as we like to think we’ve grown up, sometimes adults do the same thing. Maybe we don’t intentionally write out reminders to be bitter, but that doesn’t necessarily keep us from looking for those reminders anyway. Maybe there is someone who has hurt you, someone whose actions offend you, or even just someone who simply rubs you the wrong way. An unfortunate part of our human nature is, once we’ve reached a conclusion about someone or something, we tend to seek out evidence to support that conclusion. We easily accept the “reminders” to harbor bad feelings towards someone, but are skeptical toward the things that might dampen that negativity. This advice above from James would be a much healthier reminder to wake up to in the morning. Let’s be quick to hear the good things about other people. Let’s be hesitant to speak poorly of others. Let’s be hesitant to allow negative thoughts to define others in our mind. Instead, let’s remember that the people we have the hardest time loving are often the people who need love the most. The people who seem to have the least likable character are often the people who most need to be encouraged in the things they can do right. Just as you need to be reminded of God’s love and mercy that covers your sins, these are people who need to know the same thing. Jesus commands us to love our enemies, bless those who curse us, and pray for those who mistreat us (Luke 6:27-28). We can’t do these things if we’re allowing bitterness to fester in our hearts. Somebody once said, you can’t hate someone and pray for them at the same time. Next time you catch yourself dwelling on negative thoughts about someone, stop and pray for them. Is there someone in my life that I subconsciously view as the “exception” to Jesus’ command to love? Have I been taking my thoughts captive and making them obedient to God (2 Cor 10:5), or allowing negativity and bitterness to run amuck in my head? Am I honoring God’s forgiveness towards me by showing that same forgiveness to others? For what it’s worth, the note by my bed didn’t work. By the time I woke up in the morning and saw the reminder, I was over it.